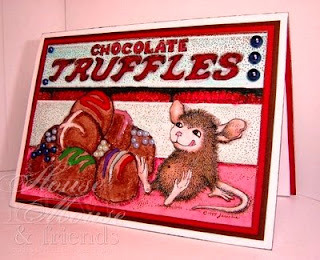 The Stamp used here is House Mouse Designs "Chocolate Truffles" Mudpie, #HMTR1015. Lots of coloring and detailing went into this card... 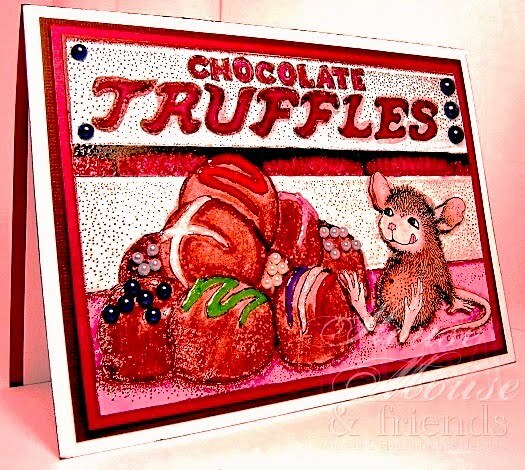 I wanted the chocolates to look realistic so I clear embossed the main image, colored and outlined every detail then used Dimensional Paints and multi tiny colored half-pearls to decorate them. What are your thoughts??? "***Natural Chocolate Craving***" haha - that's great! Gorgeous and So yummy!!! I can sure tell this took a while to make! LOL!!! I could not figure out the natural to begin with. But get it now . Beautiful card. Absolutely stunning - the colours just pop off the page - they are just the cutest stamps ever! This is so so cute. I love your natural and I agree chocolate is a natural craving. hee hee Great coloring and looks yummy! Beautiful creation! Love the bright colors! A very sweet card ! I love it!! This is totally my natural state of being :) It's very obvious you put ALOT of time and energy into this card...awesome job! 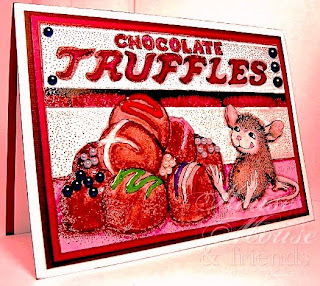 Love the tiny beads, they really add alot and look like sprinkles....okay, now I NEED some chocolate! Love this card. Your coloring and embellishing is great. I have this stamp but haven't used it yet. Great take on the "Natural" theme. Love that 'natural chocolate craving' card! It captures the feeling perfectly! Fabulous card America....even though it is making me hungry when I am trying to diet!!!! 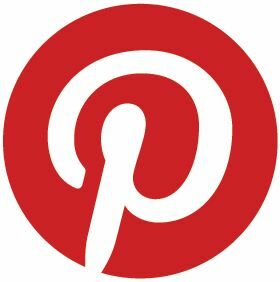 I could comment on all your cards, they are fantastic....another great blog for me to watch!